Buoyed by a new national poll putting him ahead of Hillary Clinton and outpacing Republican White House hopefuls by big margins, Bernie Sanders returned here for a rally on Thursday two days ahead of contests in Washington, Alaska and Hawaii. The new Bloomberg Politics national poll found that Sanders is now the first choice of 49 percent of those who already have voted or plan to vote in this year’s Democratic contests. The former secretary of state was the choice of 48 percent. Looking ahead to November’s general election, Sanders was 24 points ahead of Republican front-runner Donald Trump. He outpolled U.S. Sen. Ted Cruz of Texas by 12 points and held a four-point lead over Ohio Gov. John Kasich. Clinton, in sharp contrast, lost to Kasich by four points and held much narrower leads than Sanders over Cruz and Trump. The Bloomberg survey was only the latest in a string of polls putting Sanders way ahead of Trump and doing consistently better than Clinton against Trump and the other Republicans in a general election. According toRealClearPolitics, Sanders led Trump on average by 17.5 percentage points in national surveys in March. The U.S. senator from Vermont beat the real estate tycoon by 20 points in a CNN/ORC poll, 18 points in a poll for NBC News and The Wall Street Journal, 14 points in Fox News and Quinnipiac University polls and 15 points in a survey for CBS News and The New York Times. 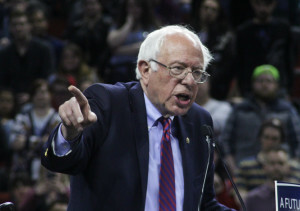 Assessing the Democratic Party nomination contest, pollster J. Ann Selzer said Sanders “is the one Democrats see as looking out for them – meaning he will build a stronger middle class at the expense of Wall Street. They trust him to do it. In the end, Hillary Clinton has a trust problem.” The poll, for example, found Democratic primary voters by a better than 2-to-1 ratio said Sanders would fight harder than Clinton for the middle class and do the most to rein in the power of Wall Street. More than 60 percent said Sanders cares most about people like them and regard him as the most honest and trustworthy candidate. Only a quarter said that of Clinton. The new poll came two days after Sanders won 21 more delegates than Clinton in three Western states on Tuesday. In Idaho on Thursday, Sanders picked up endorsements from Democratic Party Chairman Bert Marley and Pete Gertonson, a national DNC committeeman. “Pent up frustrations of a red state exploded Idaho Caucuses to historic numbers last Tuesday with 78 percent for Bernie Sanders,” Gertonson said. “I’m proud to be an Idaho Democrat representing the people’s choice.” The new backing came in addition to 17 elected delegates Sanders picked up in Idaho.